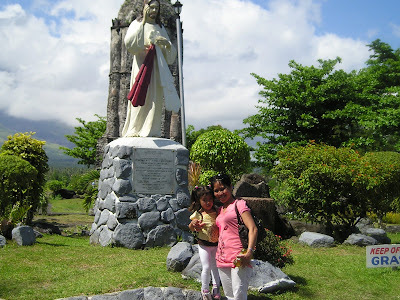 My friend Jane and her family gave us a tour in some of the tourist spots in Albay province last March 22. 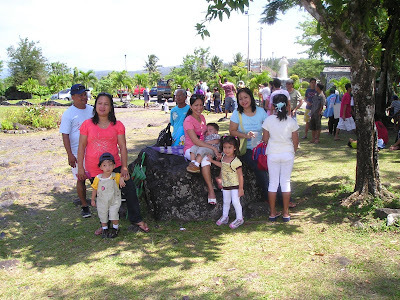 Our first stop was in Cagsawa Ruins. Passing by the road to Cagsawa, I can't believe how much damage the typhoon Reming did to the place. 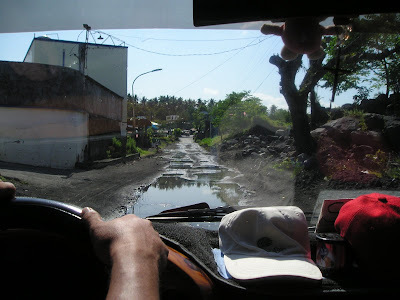 It was so developed when I left and now the road look like this. Some of the houses were washed away by flood that came from heavy rain and the lava from Mayon Volcano. Here are some snapshots we took during our stay there. 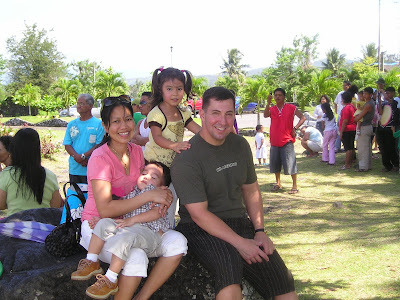 Here's Jane family with me and the kids, EJ was sleeping. They still have the swimming pool, my daughter freaked out because we didn't bring her bathing suit and she really wanted to plunge in the water. I would like to take this opportunity to thank the Baldon and Siapno family for spending quality time with us while were there. Thanks also to Haidz and Mike for your wonderful friendship. We're gonna miss you guys for sure..
wow nice place manang..breathtaking views....may typhoon pala dyang bago? sowe d na kasi ako nagwatch nag balita sa pinas...hehehe! woi colorful pala tong orchids for sale...hehehe...joke! the photos shows that you really enjoyed your short tour. it's good that the tragedy is now less remembered there. 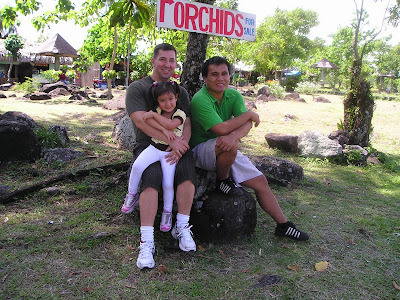 hahaha i like that orchids for sale picture...very rare na mga orchids yan ha! hehe..
Looks like you had a good time, thanks for sharing the pictures and thanks for coming by. No the lady was very sarcastic to me. nice view rose, nag enjoy talaga kayo sa atin. that is very interesting orchids :-), never seen those kinds before :-). Nakakatuwa ang mga orchids! hehehe! Ang saya saya naman! thanks for sharing Rose, hay naku talaga nga naman pag nature na ang magalit noh? i added this blog in my two blogs already, just check it okay.. I love your photos. Your family is a picture of love and joy and I hope it stays that way forever. Your children are so fortunate to have parents like you and Joops who take good care of all their needs. I am so happy to note that you actually enjoyed your vacation in the Philippines in spite of all the hassles at the DFA. Praise the Lord for all the wonderful things He has done for you and your family. Thanks for the wonderful post. God bless you all always. Those are wonderful photos of your vacation in the Philippines. 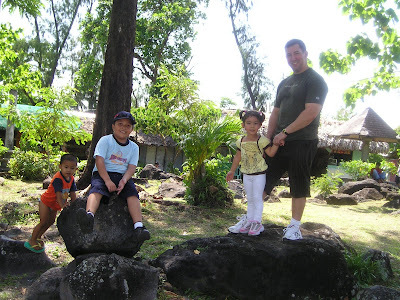 Your husband and kids seemed to have enjoyed their stay at Bicol with all the wonderful places you visited. 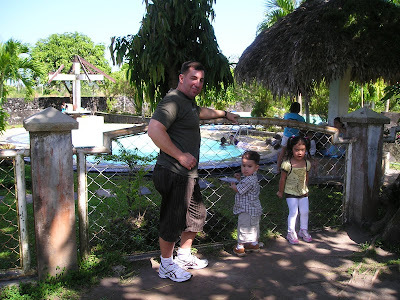 Did your husband like the taste of Mazapan sweets and other pili delicacies? They are better than chocolates. Thanks for the post. God bless you all always. ang saya-saya naman dyan Ate Rose! !Talagang nag-enjoy kayo!! Nice place, nature is the best! Wow looks like a fun vacation! would you like an xlinks? Thanks for stopping by my blog and your kind comment. Feel free to visit again. Cheers! Great place .... wonder to an eye !! thanks for comment. I'm here in Pinas now! mukhang walang katapusan na enjoyment ah. sad to see the ruins but glad to see the happy faces in those pics. that was a blast vacation u've had sis. following u on twitter now too, and thanks for following me. hiya sistah, wow I didn't you have posted your trip already! wow nice places dangz... glad you enjoyed your vacation... so how was everything then? Ang saya ng magbakasyon lalo't kasama mo ang buo mong pamilya 'no? Nakita kon na naman ang magandang tanwin ng Bicol! Gusto ko na ulit bumalik. Thanks for the PR info, Rose. Unbelievable ito! he he..
kawawa naman yong mga tao nawalan ng bahay.